Ever had a thought how cool and convenient it would be to sign documents in the same program you prepare them? Say, Microsoft Word? Well, we’ve been thinking about that for a while and today we are proud to announce that this possibility has just become real! 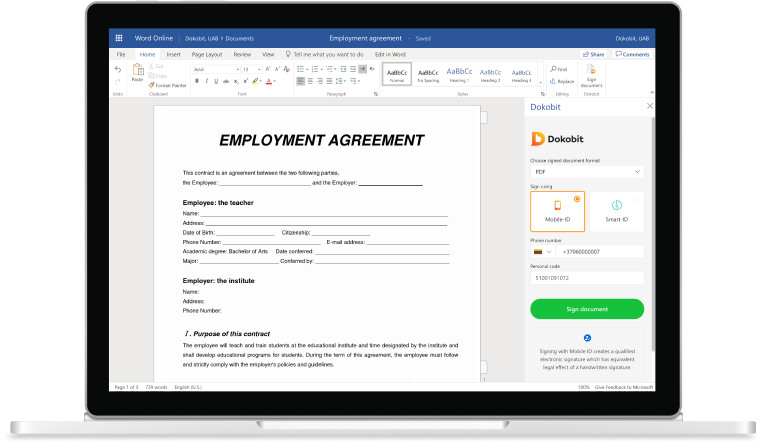 From now on, documents with e-signature can be signed right on Microsoft Word with Dokobit for O365 add-in. This means that more than 1,75 million Lithuanians, Latvians, Estonians and Icelanders who have mobile signature or Smart-ID app will be able to take document signing to the next level. Imagine it… you won’t need to jump from one app to another to perform different actions, you won’t need to look for a pen that’s usually impossible to find when you need it, you can simply click a button in Microsoft Word and voilà! Document signing via add-in works the same way as e-signing in Dokobit portal. In order to sign a document in Word, you can choose a signing tool, enter your phone number and personal code, and confirm signing action by entering sPIN code. Before signing, you can also choose which international format – PDF document or ASiC-E container – signed e-document has to be converted to and then download signed document directly to your computer. Can it get any easier? You can check out the add-in by downloading it from Microsoft AppSource. (Psst, until the end of the year it’s totally free!) In the meantime, we are working on additional add-in functionalities like a possibility to share documents with other signing parties by entering addressee’s e-mail, as well as possibility to store documents in Dokobit portal. Signing Excel and PowerPoint documents and sealing them in Office 365 programs are also in our plans! Learn more about Dokobit for Office 365 here.